The Arduino 2WD four-wheel-drive robot is based on the DFRobot and widely used as self-developed control panel for Arduino platform. The platform 51 can be used not only to control STC controller, AVR controller but also for the world wide promotion for the use of Arduino controller. The Arduino platform has world's large number of users and abundant examples are available of procedures used. The two differential drives, the use of near zero turning radius, high-strength aluminum alloy body materials, plus high-quality high-speed motor and a flexible rubber wheel makes it suitable for indoor flat road surface. To make this lovely robot run, you probably need a motor controller and MCU. Our DFRduino Romeo-All in one Controller (SKU:DFR0004) is an ideal candidate for this. You may download the assembly guide in PDF from [here](http://www.dfrobot.com/image/data/ROB0005/3PA InstructionManual V1.1.pdf). Alternativley you can see this picture guide. 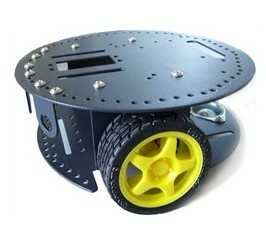 Get 2WD Mobile Platform for Arduino from DFRobot Store or DFRobot Distributor.